Melissa Sheridan, the President of CRCS Recreation, the Miracle Recreation and Little Tikes Commercial representative agency in Northern Ontario, was recently named one of the winners of the 2017 40 Under Forty Award by Northern Ontario Business, an integrated media outlet dedicated to providing vital news and relevant business information and events for the most influential business leaders and decision makers across Northern Ontario. 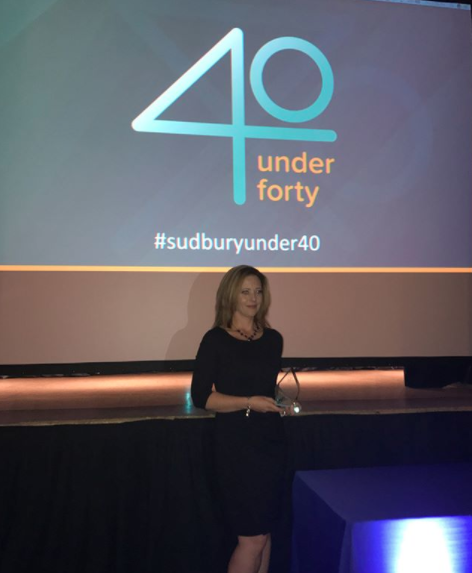 This honour is given to young emerging leaders who are actively involved and excelling in their work as well as through their contributions to the Greater Sudbury community in Ontario. In addition to being President of CRCS Recreation, Melissa holds the title of Park Leader at Kivi Park, Ontario’s premiere destination for sport, nature and adventure, set on 450+ acres of Cambrian Shield overlooking Long Lake in Sudbury, Ontario. As Park Leader, Melissa is the liaison with non-profit organizations to plan and execute events, works with donors and sponsors to continuously expand the park’s sporting facilities and beautification efforts and acts as the Kivi Park spokesperson. Melissa has been President of CRCS Recreation since 2001 and has been Park Leader at Kivi Park since the announcement of its creation in the spring of 2016. CRCS Recreation is a team of professional playground consultants and park designers who have constructed hundreds of playgrounds, splash pads, sporting venues and park furnishing sites throughout Northern Ontario. Optimists, Landscape Architect, And PlayPower Produce Award-Winning Design November 20th is National Child Day!